Sc2tog = [draw up a loop in next sc] twice, yarn over and draw through all 3 loops on hook. Adjustable-ring method = Wrap yarn in a ring, ensuring that the tail falls behind the working yarn. Grip ring and tail firmly between middle finger and thumb. Insert hook through center of ring, yarn over (with working yarn) and draw up a loop. Work stitches of first round in the ring. Pull gently, but firmly, on tail to tighten ring after a couple of rounds have been completed. 1. Jar cozy is worked in un-joined rounds. Hat is worked in joined rounds, except for the Ribbed Band, which is worked back and forth in rows. 2. Test for fit periodically by inserting jar into cozy. 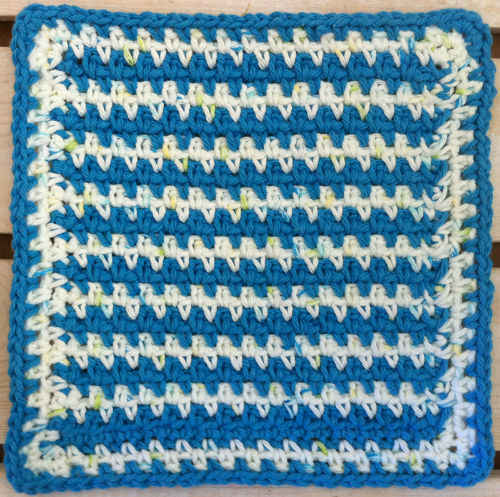 You may alter the number of stitches per round if necessary. 3. 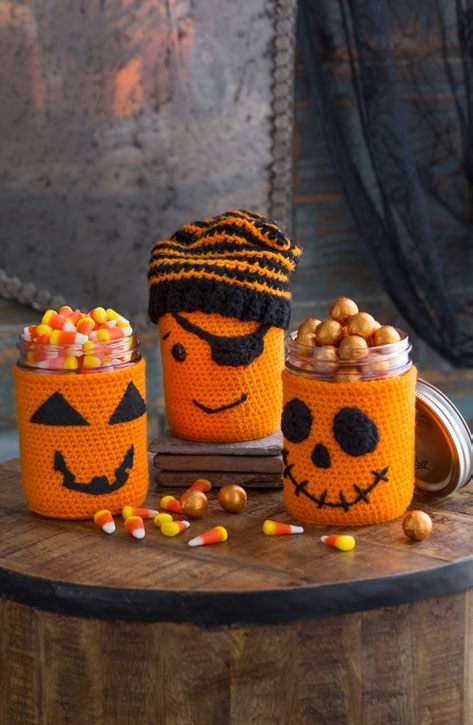 Basic jar cozy pattern is used for all 3 designs. Customize each cozy using the various facial details and accessories. Facial styles include a friendly pirate, smiling skeleton and traditional jacko-lantern. 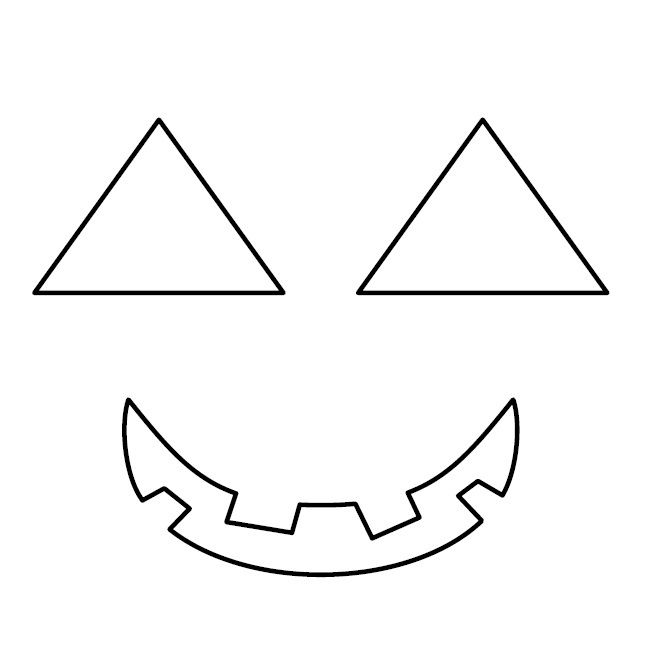 Techniques for each face are found under their specific heading. 4. To change color, work last stitch of old color to last yarn over. Yarn over with new color and draw through all loops on hook to complete stitch. Proceed with new color. With A and smaller hook, make an adjustable ring. Round 1: 6 sc in adjustable ring, do not join this round or any round of Cozy. Place marker for beginning of round and move marker up as each round is completed. Round 3: * Sc in next st, 2 sc in next st; repeat from * around – 18 sts. Round 4: * Sc in each of next 2 sts, 2 sc in next st; repeat from * around – 24 sts. Round 5: * Sc in each of next 3 sts, 2 sc in next st; repeat from * around – 30 sts. Round 6: * Sc in each of next 4 sts, 2 sc in next st; repeat from * around – 36 sts. Round 7: * Sc in each of next 5 sts, 2 sc in next st; repeat from * around – 42 sts. Round 8: * Sc in each of next 6 sts, 2 sc in next st; repeat from * around – 48 sts. Round 9: * Sc in each of next 11 sts, 2 sc in next st; repeat from * around – 52 sts. Round 10: Sc in back loop only of each stitch around. Rounds 11-15: Sc in each st around. Round 16: * Sc2tog over next 2 sts, sc in each of next 24 sts; repeat from * once more – 50 sts. Rounds 17- 33: Sc in each st around. With B and smaller hook, ch 4. Row 1: Sc in 2nd ch from hook and in each of next 2 ch, turn – 3 sc. Rows 2-35: Ch 1, working in back loops, sc in each st across, turn. Join last row to first row by working a row of sc through both layers. Round 1: Ch 1, working into row ends of Ribbed Band, work 44 sc evenly spaced around, join with slip st in first sc. Change to A and larger hook. Note: For remainder of hat, work all sts in back loops only. Round 2: Ch 1, sc in each st around, join with slip st in first sc. Change to B; continue using larger hook for remainder of hat. Round 3: Ch 1, sc in each st around, join with slip st in first sc. Round 4-11: Repeat rounds 2 and 3, alternating colors. Round 12: Ch 1, sc2tog over first 2 sts, [sc in each of next 8 sts, sc2tog over next 2 sts] 4 times, sc in each of last 2 sts, join with slip st in first sc2tog – 39 sts. Round 13: Ch 1, sc in each st around, join with slip st in first sc. Round 14: Ch 1, sc2tog over first 2 sts, [sc in each of next 7 sts, sc2tog over next 2 sts] 4 times, sc in last st, join with sc in first sc2tog – 34 sts. Round 16: Ch 1, [sc in next st, sc2tog over next 2 sts] 11 times, sc in last st, join with slip st in first sc – 23 sts. Round 17: Repeat Round 13. Round 18: Ch 1, sc in first st, [sc2tog over next 2 sts] 11 times, join with slip st in first sc – 12 sts. Change to B; fasten off A. Round 19: Ch 1, [sc2tog over next 2 sts] 6 times, join with slip st in first sc2tog – 6 sts. Weave yarn tail through top opening to close hole. With B and smaller hook, ch 7. Row 1: Sc in 2nd st from hook and in each st across, turn – 6 sts. Row 2: Ch 1, skip first st, sc in each next 3 sts, sc2tog over last 2 sts, turn – 4 sts. With B and smaller hook, ch 7, slip st across top row of Eye Patch just made, ch 7. Referring to the photo for placement and using sewing needle and thread, sew button to Cozy for eye. 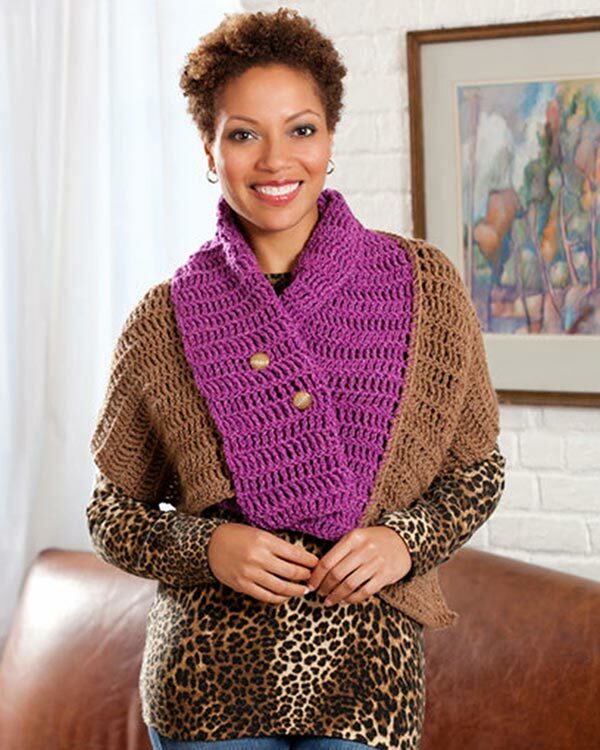 Sew Eye Patch to Cozy in the same manner, curving the ties upward so their ends are level with top edge of Cozy. Embroider eyebrow and mouth using single strand of B and yarn needle. Place Hat on jar lid. You may glue Hat to lid if desired. With B and smaller hook, ch 3. Round 1: 3 hdc in 2nd ch from hook and in next ch, rotate piece 180 degrees so that you are working into unused loops at bottom of foundation ch, 3 hdc in each of next 2 ch, join with slip st in first hdc – 12 hdc. Ch 2, 3 sc in 2nd ch from hook. 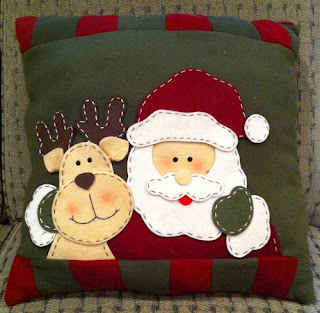 Referring to the photo for placement and using sewing needle and thread, sew Eyes and Nose to Cozy. Embroider mouth using single strand of B and yarn needle and working in short straight sts. Using template found at end of pattern, cut out felt shapes using sharp fabric scissors. Place Cozy over jar. Referring to the photo for placement, pin features securely to cozy. Remove jar and sew features on using sewing needle and thread.